Having a clear vision of what your family reunion will be like helps to avoid confusion during the reunion planning. Use your vision to guide you in selecting the date, time, and place, and to pinpoint any potential problems. Most reunions take place during the summer. This time of year is usually best because of favorable weather, children being out of school, and folks taking time off for vacation. If you choose to have your reunion sometime other than the summer months, try to schedule it close to a three-day weekend or during spring break. If you decide on a spring-break date, be sure to check with all the families who have kids in school because spring breaks can vary. If you schedule a reunion in mid-October, family members with school children probably won’t be able to attend. If you schedule a reunion in the winter, try not to schedule anything too close to major holidays, such as Christmas or Hanukkah. These are busy times of the year for most people, and their priorities may be elsewhere. Besides, have you ever seen a busy airport just before or after a major holiday? It’s a zoo! You can determine the duration of the reunion by using some common sense. One-day reunions are the easiest to plan and are the norm for families who live within driving distance of each other. These reunions are usually simple affairs, such as a picnic at the park or a backyard barbecue. However, one-day reunions can seem like a bit of a waste to folks traveling across the country to get there. Imagine paying for plane tickets, boarding a crowded flight in a congested airport, renting a car to attend a one-day picnic, and maybe returning to a drab hotel. That doesn’t really sound like a barrel of fun. If your family is coming from far and wide, consider holding a weekend reunion that lasts two days. Hosting a hospitality night for folks on Friday evening with snacks and drinks or a light supper. Holding the main reunion event (such as a dinner or a picnic) on Saturday. Having a casual, anything-goes day on Sunday. Multiple-day reunions are the most enjoyable and memorable type of reunions. Spending two or more days with relatives that you rarely see is a treat! When planning the date for your reunion, choose at least three possible dates that are a few weeks apart. After selecting a few potential dates, get some feedback from the rest of the family by using the survey in Figure 1. 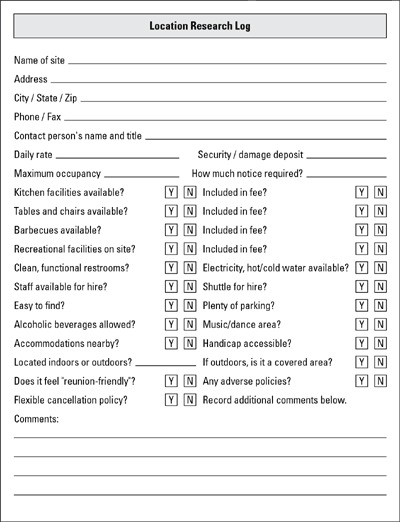 Mail a survey to everyone on your guest list to find out which of your choices works best for each member of the family. Doing so helps avoid potential problems later — mainly, the lack of attendees. 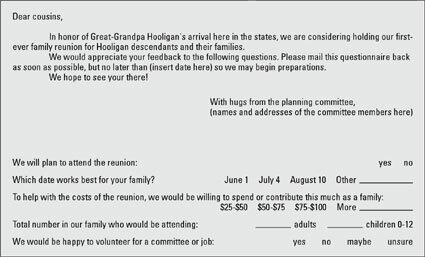 Figure 1: A reunion survey solicits feedback from family members. You can use your computer’s mail-merge program to make preparing the survey envelopes a quick and painless task. Most computers come equipped with software that features some type of address book. All you have to do is select the addresses and click a button, and your computer prints the addresses on envelopes or labels. Printing addresses directly onto the envelopes is a bit more time-consuming than labels because you have to stand at the printer and feed the envelopes through one at a time. If you have a deal of envelopes to address, then use the label method. What types of foods do they suggest? What types of games and activities do they want? Do they want to help plan the reunion? Do they prefer a one-day or multiple-day reunion? You’ll get a wide range of answers to your survey. Choose the ones that have a majority following. Sometimes, this doesn’t include your top choice, so be flexible. The goal is to make sure that as many people as possible can get together and enjoy themselves, including you. When you decide on a date, stick to it. Don’t change the date to accommodate anyone, because the new date will inconvenience several others who have already made arrangements. Remember the old adage: If it ain’t broke, don’t fix it! Most small family reunions (20 people or so) tend to take place in the backyard of the family homestead or in a nearby park. Larger reunions tend to take place in rented halls, reserved park areas, and hotel facilities. Finding a venue — or a place to hold your reunion — is simple. You open the phone book and make phone calls, find out about fees, and visit the sites. Before you decide on a reunion location, take a good look at the place. Ask for the grand tour and take notes. Keep track of all the information you gather on your location tours by using a location research log, as shown in Figure 2. Figure 2: A location research log helps keep your information organized. Check out the facilities thoroughly. Is everything clean or does it smell as if people have been cleaning fish in the main hall? Is there a kitchen that you can use, and does the facility supply small appliances, such as coffee makers? Is there a fee for using these appliances? Where are the restrooms? Does the site have any recreational facilities? Is there access for disabled folks? Does the site allow for the serving of alcohol? What about insurance? Is adequate parking available? These are important issues that you need to clarify before you choose the site. Do you require a security deposit? How much is it? Always start your planning early! Eighteen months is the minimum for a large reunion; a year in advance is average. But if you’re a procrastinator, give yourself at least six months for planning and reserving the location. If you wait any longer than that, you’re pushing the limits. You want to have a variety of activities at your reunion so folks can get to know new faces as well as mingle with people they haven’t seen in years. When selecting a location, check to see what types of activities are available because you may want to add them to your activities list. For example, some indoor facilities offer swimming pools, shuffleboard areas, volleyball courts, billiards, and other nifty activities. Likewise, outdoor sites may feature tennis and basketball courts or areas for rousing games of softball or touch football. Beachside reunions can easily accommodate sandcastle contests, beach volleyball, and other beach games. If you or a family member has a backyard with a swimming pool, consider having a pool-party reunion. Make sure that the backyard can accommodate the crowd. Most pools (except the blow-up, kiddie variety) take up a lot of space, leaving little room for people and barbecue equipment. If you select a beachside location or a site with a pool, appoint a lifeguard to ensure everyone’s safety. Family members will be busy reuniting and can be distracted very easily when they are supposed to be watching whoever is in the water. The bottom line is that if you plan to have lots of activities for everyone, you can select just about any spot for your reunion. But if your list of activities is a little slim, be sure to choose a site that offers a wide range of things to do.